OTERO, Miguel Antonio. My Life on the Frontier, 1864-1897. N.Y., 1935, and Albuquerque, 1939. 2 vols. Illus. [x], 293; [xiv], 306pp. Orig. cloth. Fine in d/js. Howes O-141. Vol. I limited to 750 copies signed by the author. Vol. II limited to 400 copies. NEW YORK: PRESS OF THE PIONEERS. VG. INK GIFT INSCRIPTION.. 1935. Condition: VG. INK GIFT INSCRIPTION. New York: Press of the Pioneers, 1939. Hardcover. Very Good in Very Good DJ. 6 x 9, 306 pgs. 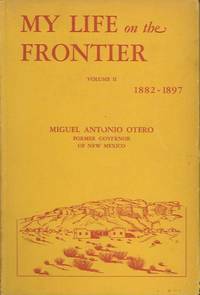 Otero's experiences as a young man in New Mexico Territory as it struggled to emerge from lawlessness and mob rule to law and order and statehood. Hard to find. NEW YORK: PRESS OF THE PIONEERS. SOME SOILING TO COVERS, OW VG.. 1935. FIRST. D 0 8 x z x z T 1 8 x z x z , 2 < 3 0002 DevLoader*vcomm Enumer atorlptenum.vxd Contention*vpd PortDriverlpt.vxd ON WA TCH J OHNSON, THOMAS M. COLLECTING THE EDGED WE APONS OF THE THIRD REICH SCHALDACH, WILLIAM J PATH TO ENCHANTMENT AN ARTIST IN THE SONO RAN DESERT Bailey, Albert J Niedrach, Robert J. PICTORIAL CHECKLIST OF COLORADO BIRDS MUENCH, DAVID TI . Condition: SOME SOILING TO COVERS, OW VG. New York: The Press of the Pioneers, 1935. Limited First Edition. Hardcover. Octavo: G+/no-DJ hardcover: Brown spine with darker brown text: Boards re strong with general shelfwear, some rubbing, 2 small stains on back board, pastedowns have age toning, binding solid: Textblock exterior is age toned, endpapers also age toned, signed by the author and hand numbered 613 out of a limited run of 750, rest of text clean and unmarked: 293 pp. FP New Rockville Stock. The Press of the Pioneers, incorporated. Used - Good. Former Library book. Shows some signs of wear, and may have some markings on the inside.